A few years ago, my mom gave us money for Christmas with one small request: tell her what we bought with it, so she could know what she “gave” us for Christmas. With a request like that, it’d be boring to stick it in our checking account and just use it to pay bills. So I intentionally chose something to spend (part of) the money on as a special Christmas present. I chose this jewelry box from Target. It’s a pretty good one, which is probably why they’re still selling it years later. 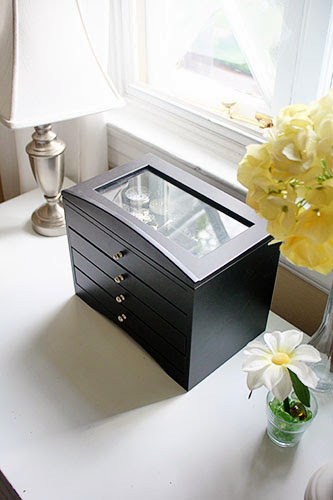 This jewelry box was a big step up from my previous “jewelry box”... which came from the automotive/hardware department of Wal-Mart, and would be used to store screws and nails and other small tool-y bits. Like this one. I’m pretty sure I had one exactly like that in red. That seemed like an excellent storage solution for many years. So many tiny drawers! Clear plastic so you can see what’s inside! And it was fantastic... until I knocked it off a shelf and it fell four feet onto my closet floor. The drawers don’t have any sort of covers, so EVERYTHING went EVERYWHERE. It was hilarious and also kind of a disaster – mismatched stud earrings bounced into my shoes, my dad’s wedding band was buried amidst cheap beaded bracelets. After staring at the disaster in wide-eyed, stunned silence, I finally sorted out a few important things and scooped everything else into a leftover Amazon cardboard box. And then I left it in that box, tangled and jumbled, FOR YEARS. I purchased that jewelry box as a Christmas present, but also as an impetus to get that my shameful-Amazon-box-of-jewelry under control. And although the jewelry box is a little too full and cluttered today, it’s at least better than it was shoved in that cardboard box. 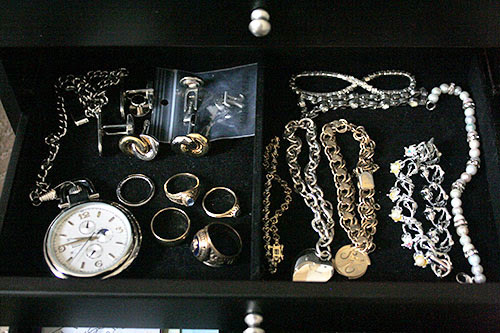 One problem: that jewelry box doesn’t hold all my jewelry. I keep the important (read: valuable) and frequently-worn stuff in there. But the rest? It’s still in a cardboard box. Actually two cardboard boxes. Nicer cardboard boxes, surely, and it’s more organized in those little plastic bags. I cleaned out my jewelry before we moved, so I was mostly down to only the stuff I wanted to keep. But nonetheless. I was still keeping it in a CARDBOARD BOX. And that’s not even all of it! Occasionally I retrieved an item from the cardboard box but couldn’t fit it into my jewelry box after I wore it. So I shoved it in this drawer with my swimsuits and other ephemera. There are two problems with this. First: I got bummed out every morning when I looked in my jewelry box and that drawer to find some accessories to go with my outfit. Every morning! That’s a sad way to start the day. And second, I felt like I never had any fun jewelry to wear, but only because I COULDN’T FIND IT. The rare times I dug out through what I had, I realized I actually have a lot of great jewelry! But because I couldn’t see it, I forgot that I had it, and I was tempted to buy new stuff without a good place to store it... thus perpetuating the cycle. I recently decided I had had ENOUGH of that. 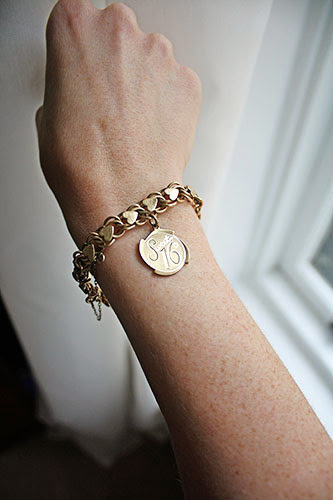 Time to get this jewelry situation under control, once and for all! 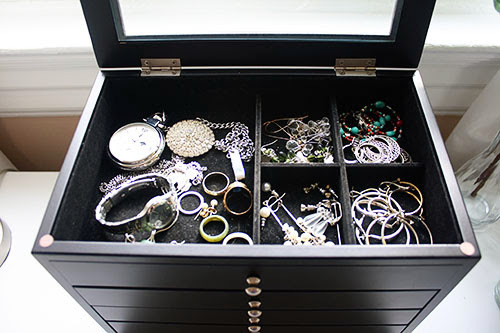 My goals were two-fold: first, clear out and organize my jewelry box, and second, organize everything that wouldn’t fit in the jewelry box in that dresser drawer. 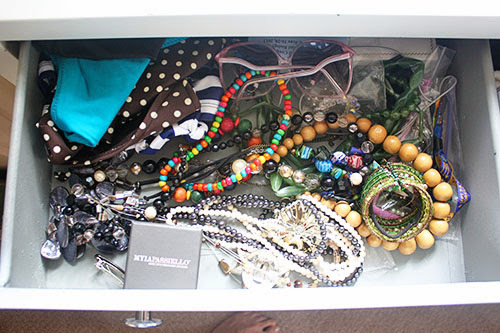 Yes, all those beautiful jewelry storage-display projects on Pinterest, and I’m hiding mine away in a drawer. While I do have some pretty items, I just couldn’t bring myself to put my clutter on display. I figure I’m not taking the door off my closet, no matter how nicely organized my closet is. Similarly, I’m not hanging my necklaces on a jewelry tree. I thought about it, but it’s not me. Into the drawer they go! I found those at HomeGoods, where they were $4 each. They always have those decorated cardboard containers in their office section, but it seems rare to find more than one with the same pattern. This time I found two matching patterns for each kind, and the contrasting styles even sort of work together! So, I figure I’ll keep these around for organization for a while, which is why I was willing to pay $16 for them. It might look a little jumbled to you, but now I have every single item of jewelry I own displayed in front of me! This is huge, people. 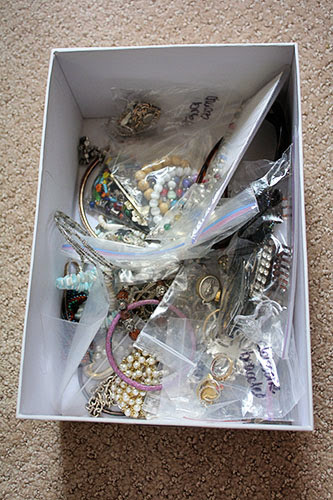 I’ve kept most of my jewelry in some form of cardboard box since before Mr. P and I got married, after that hardware-storage unit crashed to the floor. That’s years of not having any idea what jewelry I have. Now I can see it all! 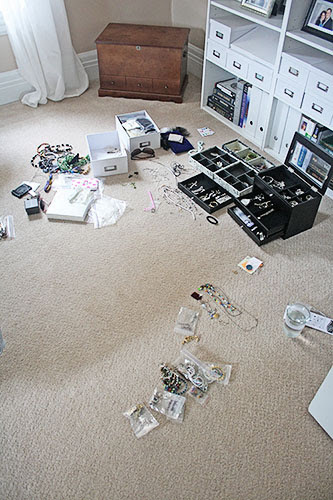 Which brings me to my second solved problem: you guys, I am now convinced that do not need any more jewelry. Forget buying new stuff; I’ve got plenty of fun accessories already! Look at this treasure: my mother’s sweet sixteen charm bracelet from the 1960s. I mean. How awesome is that? Similar but better than the trendy stuff out there, stuff I coveted before I realized the treasures I already own. You better believe I’m going to start wearing it. Finally, let this be a lesson to us all: any organization is better than none, and the right organization is not always the fanciest. Those Pinterest projects are beautiful and certainly feature jewelry as art, but I put off organizing my jewelry for so long because I wanted to find the perfectly creative pin-able solution. In the end, I needed the organization method that was right for me: storing it away, not hanging it on the wall (I couldn’t think of one that was right for our rented home), and easy to maintain. 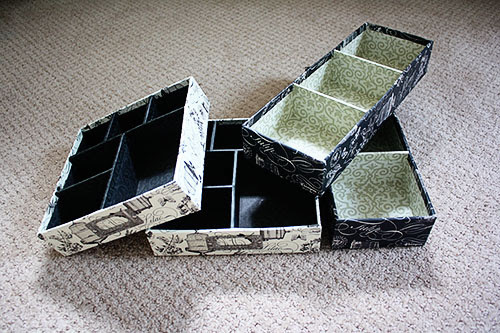 If you have a organization problem like mine, don’t fret over building a pretty solution... just get a few boxes and GET IT DONE. I guarantee that you will feel like it looks amazing. So: mission accomplished! 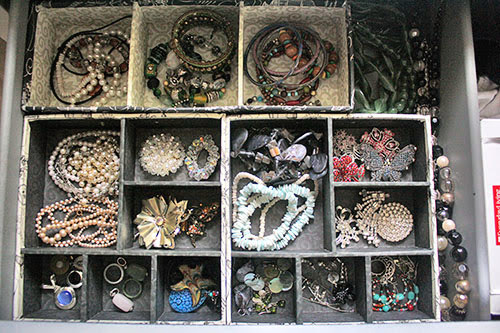 All my jewelry is beautifully organized, and re-discovering all my new-old jewelry is totally delightful. Getting dressed is so much fun now! Love this post! 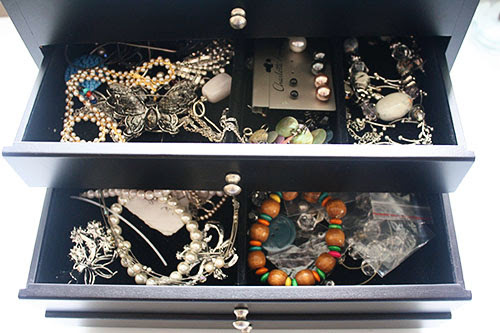 I'm always looking for new ways to organize my jewelry. I have a couple of jewelry "trees" for earrings and bracelets, and all of my necklaces hang from one of those over-the-door coat hanger thingys. But really I just need to get rid of half of my collection of $3.80 jewelry from Forever 21. Quality over quantity, Mary Beth.